The Program Agency deeply regrets the forced departure from Taiwan of David and Elizabeth Gelzer. They have fulfilled important roles at Tainan Theological College and in the life of the Presbyterian Church in Taiwan. 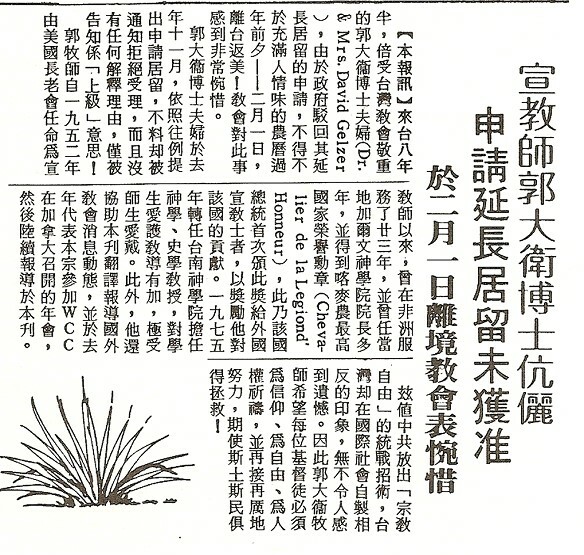 We are also concerned about the implications for religious liberty of the decision of the Government of the Republic of China to expel the Gelzers from Taiwan which was done seemingly for the simple reason of their being faithful representatives of the Presbyterian Church in making known to the wider church the position of that church in regard to the future of Taiwan. This act would seem to reaffirm the stance of that government in opposing self-determination for the people of Taiwan and in refusing to give the people of Taiwan an opportunity to shape their own future. This position of the government would seem to be related to the decision of Taiwanese authorities to imprison General Secretary C.M. Kao, whose release has been the object of prayer for Christians throughout the world.